Global equity markets posted their worst performance in seven years in 2018, although most of the damage was done in the fourth quarter. The step-up in volatility towards year–end was variously attributed in the media to US–China trade tensions, signs of a global economic slowdown and concerns about the US Federal Reserve’s plans for further interest rate increases in 2019. For the Australian market, the 3% fall for the year was its first decline since 2011. The New Zealand market posted a positive return of just over 6% for the year, likewise its lowest return since 2011 but still representing a seventh consecutive year of gains. In developed markets outside Australia and New Zealand, annual returns on an unhedged basis were modestly positive thanks to weaker local currencies, while emerging markets ended down around 5% for the year—although this followed a robust 27% gain in 2017. In sectoral terms, financials, communication services and energy stocks were among the worst performers for the year in Australia and globally, while gains were made in healthcare, IT and real estate investment trusts (REITs). REITs also beat the broad equity market in other developed markets, although this trend was reversed in emerging markets. While 2018 was a rockier year for equity markets than we have seen in recent years, with volatility increasing towards the end of the year, a longer-term perspective shows the virtues of a patient approach. 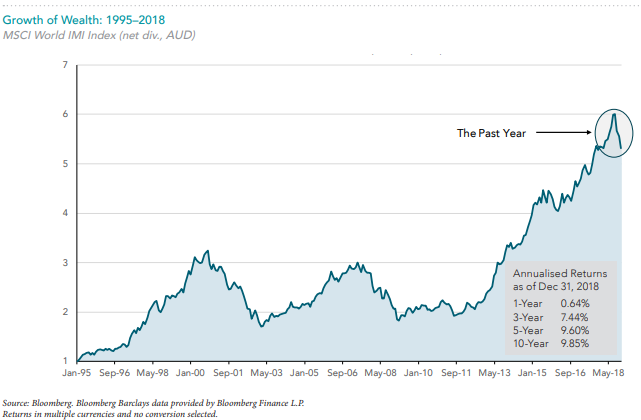 The chart below shows the growth of wealth from a dollar invested in global share markets going back to the mid1990s, using the MSCI World IMI index as a proxy. The past year is highlighted towards the end of the line. Some of the headlines that dominated media coverage in 2018 are included below in a separate table. These headlines are not offered to explain market returns, but to provide a reminder of the importance of viewing events from a longterm perspective and to avoid making investment decisions based solely on the news. While market volatility can create anxiety for some investors, the record shows that reacting emotionally and changing long-term investment strategies in response to immediate news and short-term declines can prove more harmful than helpful. Now, as a new year begins, the media’s focus inevitably turns to speculating about possible developments in 2019.
you could forecast events, you still need to anticipate how the market will react. These headlines are not offered to explain market returns, but to remind investors the importance of viewing events from a long-term perspective and to avoid making investment decisions based solely on the news.